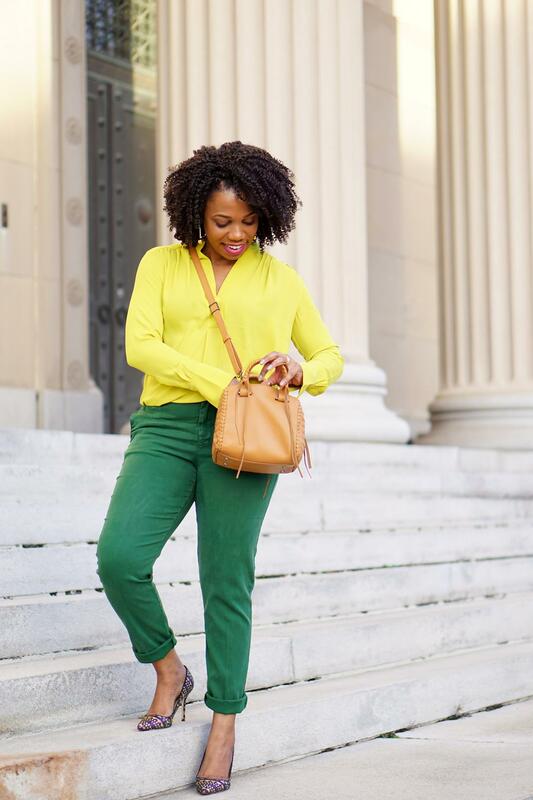 I’ve already been having so much fun experimenting with my spring style because it’s been feeling like spring in St. Louis. When the temperatures hit 70 degrees the other day, y’all, I piled on all of my favorite things for standout spring style. Vivacious color. If you’re not used to wearing bright colors, Spring 2017 is the year to give it a try. The must-wear colors of the season are bold, from shocking pinks to hello yellows. To turn up the brights even more, I block my colors. 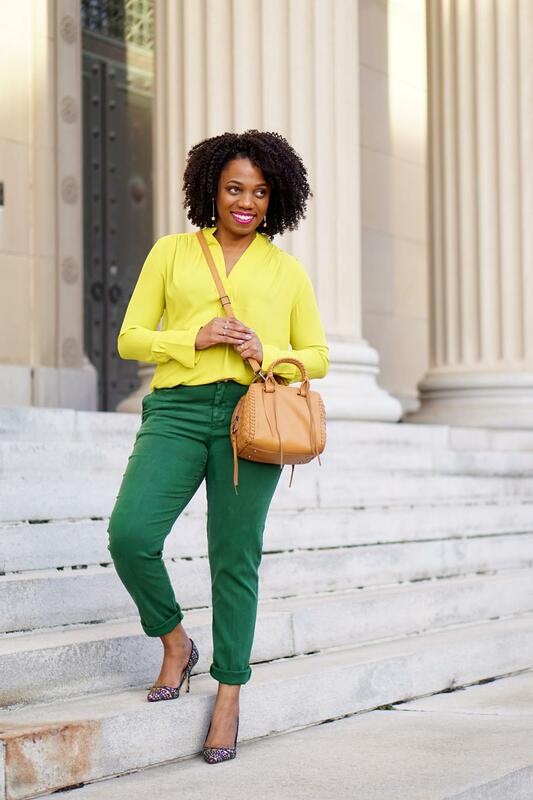 This yellow, silky Ann Taylor blouse (now at sale-on-sale pricing), a standout on its own, makes color magic when paired with my vibrant green chinos. Luxe leather in a neutral hue. I think deeply about all my purchases, but handbags are the purchases that I agonize over the most. There are so many factors to consider, from versatility to function to style. 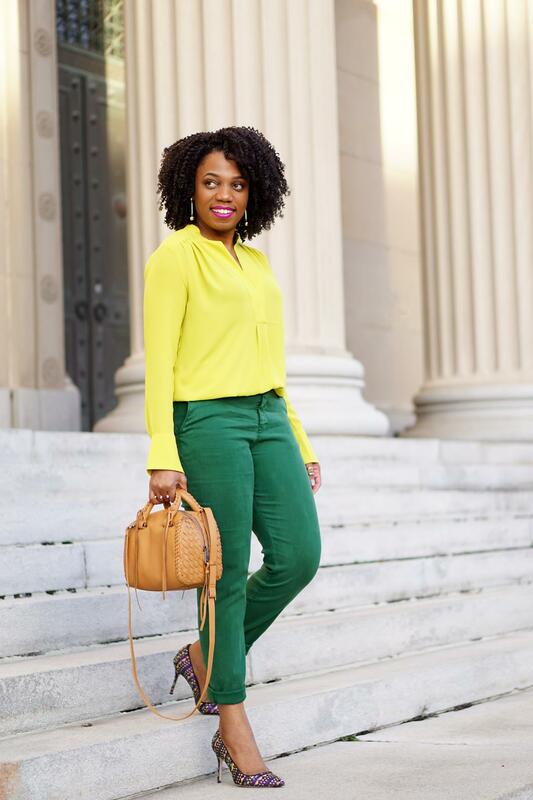 When I spotted the Linea Pelle Whitley Mini Speed, though, I knew it would be perfect for holding down my spring ensembles. 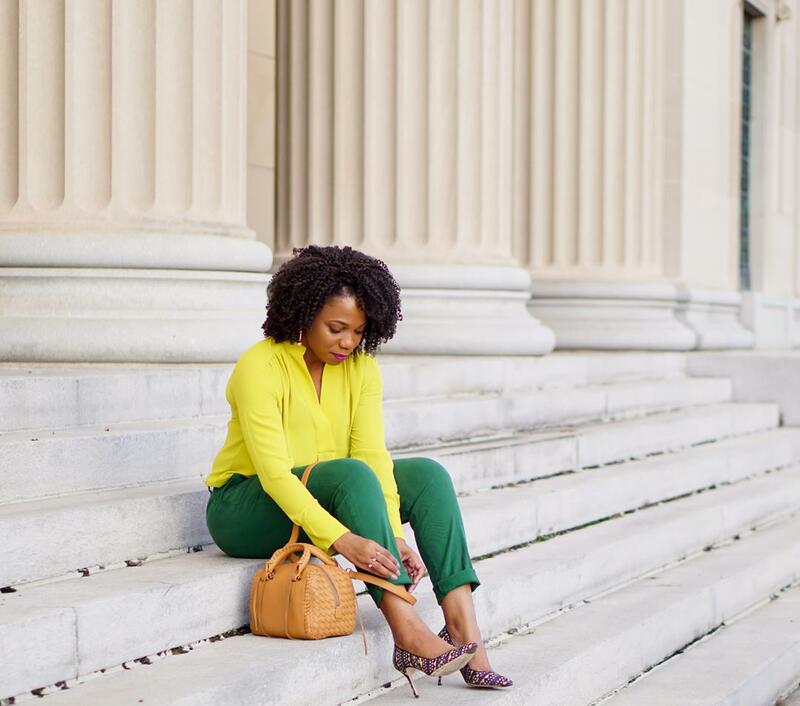 It comes in a beautiful scotch color that pairs well with my favorite brights. It has that smaller size I’ve been favoring lately, but it’s spacious enough to hold all my essentials. Of course, it has all the funky details I love about Linea Pelle bags―fun tassels, luxe hardware, and a woven design. It also comes in a right-on-trend satchel silhouette with top handles but features a detachable crossbody strap for easy carrying. So, bold color on bold color with a touch of luxe leather. Yup, that’s pretty much my spring style in a nutshell. Thank you so much, CAPIS!! Stunning!! I love the vibrant yellow blouse!! Thanks so much, my dear, Janel! Great color blocking! Very nice pants!